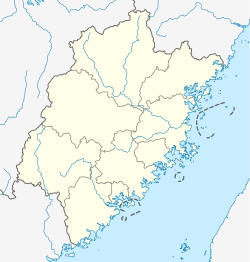 Wuyishan City (Chinese: 武夷山市; pinyin: Wǔyíshān Shì) is a county-level city in the municipal region of Nanping, in the northwest of Fujian province, People's Republic of China, bordering Jiangxi province to the northwest. It corresponds to the former Chong'an County. A local subsection of the Wuyishan Mountain range, which forms the entirety of the geological and political divide between the provinces of Fujian and Jiangxi, is a front-rank national park called simply Wuyi Mountains. Since 1999 the park zone has been recognised by UNESCO as part of the world's natural and cultural heritage. Cultural sites within the zone include the original cultivation ground of the Dahongpao tea variety, and a villa retreat used by Zhu Xi, a Confucian revivalist scholar-official of the rump or Southern Song Empire. South of the zone, just short of the City's border with Jianyang District, is a major archaeological excavation of the vanished State of Yue (Template:Linnktext). Not far from Wuyishan, the Jiyufang Laolong kiln (吉玉坊老龍窯), located in a village near the town of Shuiji, has been able to restart production of Jian ware using original clay. The city executive, legislature and judiciary are in Chong'an Subdistrict (崇安街道), together with the CPC and PSB branches. The Nanping Wuyishan Airport serves the Wuyishan area. The Hengfeng–Nanping Railway and Hefei–Fuzhou High-Speed Railway pass through Wuyishan. Wikivoyage has a travel guide for Mount Wuyi. ^ "Nanping Travel Guide". TravelChinaGuide. 1998–2013. Retrieved 1 September 2013. ^ "Wild China" 1. Heart of the Dragon. BBC. 11 May 2008. ^ "Twin Towns" (in Chinese). Foreign Affairs Office of the Fujian Provincial People's Government. 11 Nov 2012. This Fujian location article is a stub. You can help Wikipedia by expanding it. This page was last edited on 14 December 2018, at 12:25 (UTC).